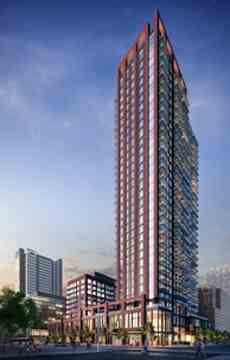 Daniels Artworks Tower Condos design consists of a 33-storey point tower and an 11-storey slab building both located above a two-storey street-related podium. Art does, in fact, ‘work’. It works to unite us, to excite us, and to put us on the world stage. You may not know this, but art has been ‘working’ in Regent Park long before the revitalization. Now, more than ever, we celebrate the achievement of a community coming into its colourful own…with Artworks. This new residental opportunity will host modern features and finishes, with one to three-bedroom designs, along with innovative amenities. Now, more than ever, we celebrate the achievement of a community coming into its colourful own. 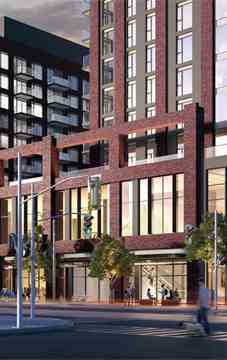 Coming to the northwest corner of Dundas Street East and River Street, ARTWORKS Tower will rise 33 storeys above this world-renowned, lively neighbourhood. Main Intersection : Dundas St East & River St.